Treat yourself to a delicious meal that benefits a great cause! 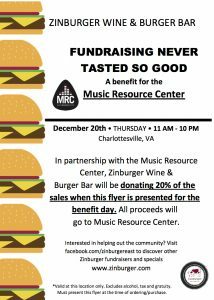 In partnership with the Music Resource Center, Zinburger Wine & Burger Bar will be donating 20% of the sales when this event is presented for the benefit day. Valid at Charlottesville location only. All proceeds will go to Music Resource Center.